I cannot possibly do this lovely lady justice but I am going to try. Terri McKay Elder came into my life via another beautiful friend. Terri is an educator and what I personally would like you to know about her is this. She's awesome! She has blessed my business by agreeing to come into my office and share information about Young Living Essential Oils. I wanted to host FREE wellness classes in my office and give back to my community and she agreed to be our instructor. I can tell you this-she is passionate and a wealth of knowledge. She is a constant and reliable source of information-answering countless questions and being available consistently. I cannot say enough about all the things we learn from her each and every time she is in my office. Of course we do things differently here at ANEW MASSAGE, because we never charge for these classes. Your wellness is my priority. Terri cares about her community and is a wife and mother as well. She does a lot and she is always supporting wellness. I cannot say enough about her and the difference she has made in countless lives. I hope you will make a class sometime and meet her so she can introduce you to "her jam!" Blessings of Health and Wellness! I can't help but share the amazing Jill with you today. It's a bittersweet day here as she is on a new adventure moving to another state. With Jill's permission I am sharing her. For over 2 and a half years I have been honored to serve as her massage therapist. Jill has Parkinson's and I don't know a stronger lady. She is absolutely an inspiration in my life. I'm honored to call her a client and friend. I am so happy and excited for her! I made her promise to come back to visit! Thank you Jill for allowing me to be part of your wellness. Blessings on your journey. I'll see you soon! I wanted to share Karen's testimony of her trip. I am so honored to know Karen and have her share her 20 years of experience with essential oils in my business. People ask me all the time why Young Living? One of many reasons why is because of people and experiences like this. Enjoy the read! Thank You Karen! (she's the adorable redhead) in the pic! 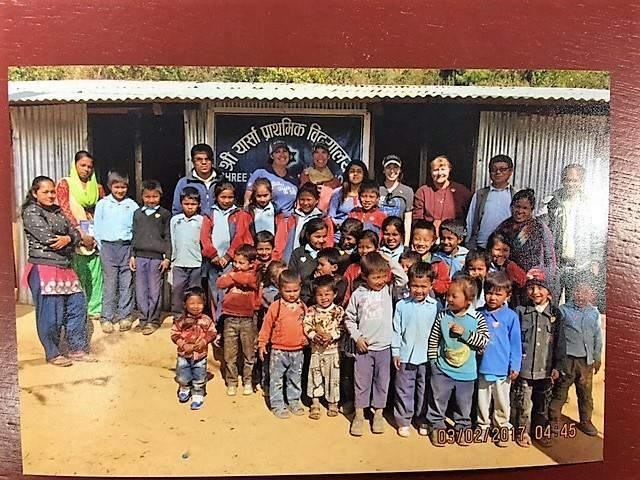 Twenty years a go I attended a nursing conference and enjoyed the talk and pictures by a dentist about his trip up into the Himalayan Mountains to share the good news of Jesus and give medical care. Before I could go the borders closed and there were no more trips. In the back of my mind this would be the ultimate trip. I specifically mentioned to my daughter in December 2016, I guess I will never see Mt. Everest now due to family circumstances and I was content with that. However, God hears our heart prayers and desires (be careful what you pray for) and I filled out an application with the Gary D. Young (Essential Oils)Living Foundation to go on a Nepal Service Trip. In April 2016 the village of Yarsa population about 450 people was destroyed. Because it was Saturday the 50 village children were not in school otherwise they would have all been killed. When Gary Young visited in January of 2016 he saw first hand families and small children struggling to survive sub-zero temperatures while living in tents or makeshift tin homes. They shared community water from a pipe, outdoor cooking and bathrooms and a sketchy light bulb here and there. The Young Living Foundation has committed to rebuild the community and in November 2016 first built the Elementary School. Gary Young brought in a brick making machine which supplies jobs to the local men along with other construction workers and equipment. It turned out the first team to build the planned 112 homes was the one I was on. Our arrival time in the village turned out to be about 5 pm. Even in Yarsa there were cell phones and they were keeping track of our progress and arrival. When our 5 vehicles pulled up and we staggered out of the cars we looked up to see the entire village standing along the upper road all holding leis they had made out of the local Red Rhododendron flower. They placed many on our necks, did the traditional bow with hands folded to say “Namaste” “my soul honors your soul”. The town “mayor” gave a welcome speech and they all clapped and clapped! There was not a dry eye on the team, talk about humbling and unworthy of such a greeting. I felt this was akin to our arrival in Heaven; long-awaited and greeted with smiling friendly faces and joy at our arrival. As darkness descended more ambiance showed up: no street lights, a light bulb hanging here and there and 10 days of a sleeping bag in an unheated tent with the lovely squat toilets, (a couple now had a rim for the ladies, but oh are they freezing in the middle of the night). We said, did I volunteer for this and paid to do it! There was not a second I regret. The people are so precious and appreciative. The valley was absolutely stunning in beauty. It was a surprise to see all this smog descending which is pollution coming over their mountain from China and India! Where in the world am I? Our team was able to build the outer walls of 5 houses while we were there and the interior walls of two. Mostly the women (9 from all over the USA ages mid 20’s to the very oldest, yes me, (age 64 1/2) were the “brick girls”. Before hoisting the 25 pound brick on the wall it had to be scraped and brushed off on all sides. Because I like numbers I counted 1600 bricks for the outside walls of the first house. Do the math on 5 houses with a minimum of the 1600 bricks. That’s a lot of bricks to be cleaned and we quickly had very dirty and dusty fingernails and everything else. Oh, did I mention the ambiance of the cement, solar heated shower? We 9 women about had “bath wars” over whose turn it was (alternating days) and who used too many minutes as the “heated” water quickly ran out. It gave new meaning to a cold shower which had to be accomplished quickly at the end of the work day before the sun went down and the 8 degree night air descended. The local Nepalese homeowners quickly became friends as we built their homes together. In appreciation one brought us boiled buffalo milk to enjoy! While we were there, their New Years celebration of the year 2073 happened and they invited us all to attend, to honor us some more, no outsider had ever been before! Bless them. Where was the celebration? At the top of the mountain in what was left of the old school. This began the first of my treks up the narrow goat paths and rocks with occasional streams crossing over. The scenery was stunning but because of to many bouts with pneumonia I would get out of breath and have to keep stopping. So picture this grandma being hauled up the goat paths with a group of precious Nepali people, very humbling, (who is helping who), finally one gave me a walking stick! Now I really feel old! When we got to the top they had chairs out for us to sit in and gave us the traditional greeting with a silk-like scarf around our necks. They were dressed in their finest (very much oriental material, beautifully hand sewn) and were in a “conga” line from littlest to the oldest and went around and around to music all smiling and laughing! They invited us to join in and they danced for hours! Then lunch was served. They had been cooking up at the school building so the women made a line and they passed down these tin plates with a spoon and brought us each one! More ambiances! There was a slice of apple and orange, a couple of pink and yellow shapes that was like pork rinds, I ate all that but stopped at the buffalo intestines and other unusual looking items. Later a big bucket was brought by with what tasted like pie crust strips and they were very tasty! There were many more hours to the celebration. I was happy to accomplish my goal of negotiating through the darling Nepali interpreter and the leader of the 5 teachers a time to come and tell the children some stories, hold an eyeglass clinic and donate some general medicines and bandages etc. We planned on Thursday after lunch. Thursday arrived and most of the team went up the hill to the school. The ladies had brought enough school supplies to fill a trunk with several bags left over so that was hauled up with us. After speech’s and clapping after the presentation some went back to building but several ladies and Rosie our interpreter stayed to help. They lined the children up in the tiny room from the smallest (looked about 3 years of age) to the oldest, probably 8 around the tables. All the parents and teachers looked in the windows. All ready for the “show” and not knowing what was coming! They had never seen a puppet but I had my life-sized chicken puppet, her chicks and the coup de grace my friendly looking snake to enhance the story. Oh, those precious faces, taking in every word and getting to gingerly touch everything at the end. Then I brought out my tic tack toe board game for review. They had never seen the likes of that. I have a large flannel board and then have flannel pieces that stick, so one side of the room against the other. Oh they were so serious; they knew the answers and enjoyed the prestige of putting up the piece. Then we had “The Little Red Hen” with finger puppets. We concluded with stickers and red licorice sticks. Since they are Hindu I did not give the gospel message as usual but mentioned in the stories how very much God care for them as He does His creatures in the stories. He heard their prayers and saw their needs. I had on my simple wood cross necklace and pray I am laying the groundwork for the next one God sends. We next got the eyeglass clinic set up. I have a chart for non-readers so it works in any language. We had donated about 70 pairs of glasses to give out. The head teacher stood right with me so he could be trained to carry it on. I told him you are now the eye-doc for the village. We were able to fit about 10 pair, but once the word is out people will come from surrounding villages. The next Young Living Team has been asked to continue to bring eyeglasses for him to use. I also explained to him some simple medicines and ointments and bandages (over the counter) that we left at the school. I believe that every aspect of a person: body, mind and spirit can benefit from receiving massage therapy. My mission as a Licensed Massage Therapist is to treat every individual according to their specific needs. Each session is customized to meet those needs by integrating various modalities of massage such as Swedish massage, Myofascial release and Neuromuscular therapy into each session. I am committed to my personal growth and continuing education as a massage therapist and to working together with my clients to promote their education and participation in this powerful self-healing process. I decided to start this week’s blog with my mission statement. We see alot of these in several businesses but, do we read them? I think it’s important to and ask questions if necessary. It says alot about the service or product you are about to spend your hard-earned money on. I am a very detailed orientated person in all aspects of my life. I like to learn and fulfill goals. In the past, I used to take a great deal of things at face value when spending money but what do they say “older and wiser.” I definitely see things differently especially when it comes to my health. I wish you health and wellness always! causing your head to twist or turn to one side. My doctor suggested muscle relaxers and physical therapy. My initial thought was ughhhh. So, let's answer those questions! stops, or another new pair of shoes. relief, back pain, arthritis massage therapy helps with a variety of issues. therapy experience.Our health is our wealth! I look forward to serving you!